On June 16 Jonathan Clarke is starting a return journey to Mars. Not the real red planet, but a simulated Martian life in the polar desert of Devon Island in the Canadian Arctic. It’s all part of a project to see what some of the challenges are, should humans one day decide to live on Mars. 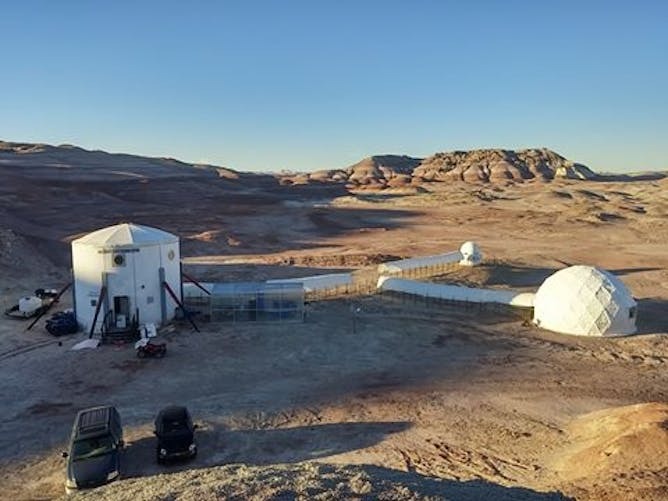 Jonathan has already spent a total of five months in simulated Martian camps, and he’s detailed some of the events as they happened across 85 Martian days of his most recent experience late last year. 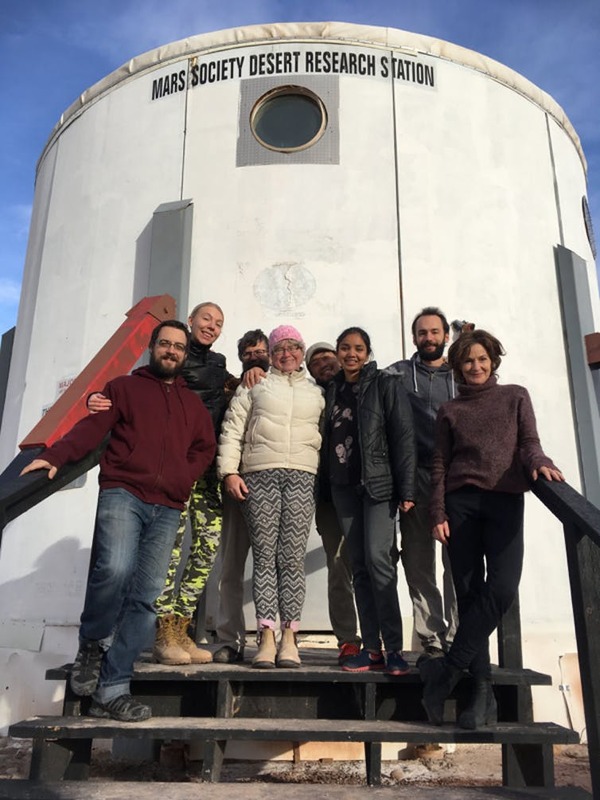 Our party has “landed” after an eventful two-day drive from NASA’s Ames Research Center, near San Francisco, to the Mars Desert Research Station (MDRS) in Utah. MDRS is a simulated Mars station built and operated by The Mars Society for Mars research and education. The core is the habitat module, a two-deck cylinder eight metres high and eight metres in diameter. It’s good to be back at MDRS; this is my fourth time here since 2003. Most of our Mars 160 crewmates are already here. We are a diverse crew of experienced expeditioners; all of us have been to MDRS before or taken part in similar expeditions elsewhere. All of us know at least one other person in the crew. There’s Alex our commander and a French engineer; Claude-Michell, a Canadian engineer; Yusuke, a Japanese architect; Anastasiya, a Russian journalist; and from Australia, Annalea (a writer and artist) and myself (a geologist). Our biologist, Anushree from India, will join us in a few days. 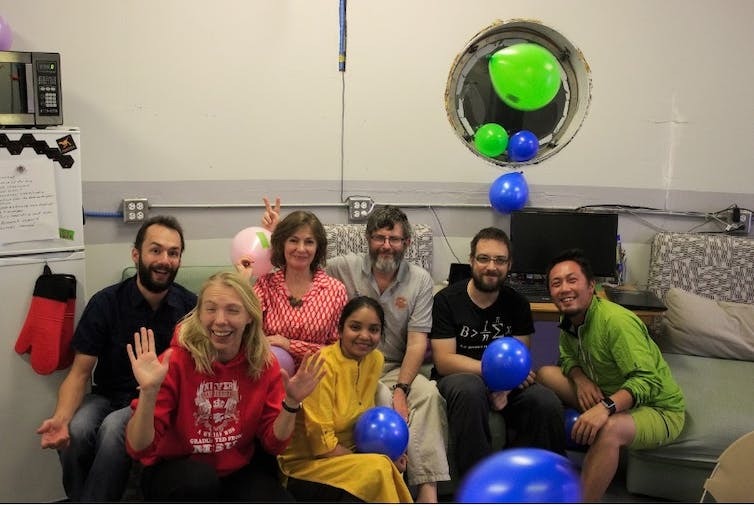 We are all supervised by Shannon, the MDRS manager and the Mars 160 principal investigator, who lives just off site. We spent the first Sol settling into our small cabins and getting to know each other. Everyone is excited. There’s a lot to do in the station before we can start making ready for the simulation. The Mars 160 expedition is different from many other Mars simulations of the past few years. We are not an isolation experiment, although we have limited contact with the outside world. Our responses to the mission are being monitored by the Institute for Biomedical Problems in Moscow, the world’s leading centre for human factors in space. Instead we are carrying out real research projects under some of the constraints of an actual Mars surface mission. We aim to better determine the realistic capabilities of future explorers of the planet. First day of our actual Mars mission simulation (“in sim” for short). From here on, barring emergencies or special circumstances, we operate as far as possible under Mars mission constraints. We only go outside when we have to, and when we do we will have to wear the simulated extravehicular activity (EVA) suits. Communications with the outside world are limited to asynchronous modes only. This means emails only, no telephone or Skype. From now on we have only shelf stable food – dehydrated, freeze-dried and tinned. Much as we would on a real Mars mission. We had a quiet day, settling into the routine. Dealing with a fragile communications system and other engineering issues. I suspect real Mars missions will be like this, routine days, constant problem solving. The weather is warm and sticky. A pack rat has decided it wants to go to Mars. We hear it scrabbling about and sometimes glimpse it in the evenings. Maybe every Mars mission needs a cat? Very busy day. Some people I have spoken to in the past seem to think the big issue in a Mars simulation is boredom. They imagine we spend our time staring at each other. Not here! We work 12-14 hours a day, on actual EVAs, EVA planning or analysis, engineering and station management tasks, report writing, communications, outreach tasks, research, cooking, cleaning and washing up. So this morning I cooked scrambled eggs, we then went on an EVA (Alexandre, myself and Claude Michell) out to Skyline rim, the prominent ridge north west of here. It’s too far to walk, except in an emergency, so we rode the quadbikes. These little vehicles are stand-ins for the small non-pressurised rovers that astronauts might use on Mars. Long-range mobility will be essential there, as the interesting sites may be many kilometres from the landing site and the station. NASA expects astronauts to explore as far as 100km from the landing site. Fortunately we don’t have to go so far. Skyline Rim itself is composed of sandstone deposited where a Cretaceous river entered the sea to form a delta, overlying marine shales. Weathering of the shales has produced a multitude of colours from dark grey through to white and yellow. Gypsum veins are common, forming great sheets of the glassy mineral scattered across the landscape like windscreen glass beside an Australian road. We have a strange relationship with the outside environment. On one hand we are isolated from it, permanently indoors, whether in the station or in our suits. On the other, we are also closely engaged with every change and detail. We are studying the geological and biological features of our landscape. We are constantly aware of the vagaries of weather such as temperature, wind and rain, as well as the shortening days, and their impact on our day-to-day activities. Looking through the porthole becomes a glimpse into an alien world, almost like living under water. Today Anushree, Annalea and I went on an EVA to an exposure of the gypsum-rich Summerville Formation of Jurassic age. Strata rich in gypsum and other sulphate minerals are common on Mars and indicate deposition by saline surface water. Studying these deposits helps us to understand past surface environments. Gypsum and other salts can also preserve chemical traces, fossils and even dormant microbes. Similar deposits are being studied by the ongoing Opportunity and Curiosity rover missions on Mars and important targets for future astronauts. It’s a spectacular site, stacked with thin, reddish-brown and cream beds of mudstone and gypsum exposed in cliffs. In the suits we find we can sample all the different rock types, labelling them and bagging them up for return to the station and further analysis. Annalea supported our EVA with a field drawing of the location from the vehicle. Field drawing is an useful technique for geological field work on Earth, and we want to explore how it might be used on Mars, even with all the digital imaging technology available to us. In the morning went on a geology EVA, aimed at sampling every colour change in the sediments between the station and the top of the ridge behind it. This provides us with a geological section through the so-called Brushy Basin Member of the Jurassic Morrison Formation. Deposited by ancient rivers, the unit is marked by repeating layers of cream, red, green, white, grey, purple and brown colours. The samples, after preliminary analyses here, will be sent to the University of Arkansas laboratory to determine their mineralogy and chemistry. We expect the colours to reflect changes in the chemistry and mineralogy, important to understanding the local Jurassic geology and also perhaps to understanding similar deposits on Mars. Annalea and I did a recorded interview for an Australian journalist. The sound file is 11 megabytes. Routine to send via a normal internet connection, but challenging for us with the bandwidth limits of our internet connection - 500 megabytes per day. Slept really well. Had a funny dream last night about the crew: we were doing this mission in a seven-berth caravan in a camping ground. Very crowded, very messy, constantly interrupted by visitors, and very muddy! Today is a day off. These are really important we have found to help us recover and recharge our batteries. We generally have one day off a week. The couple of occasions we have worked through we have ended up really feeling it. Today I did not get up to until 8:30am; a great treat is to read in bed. Nice email from the family today to savour as well. I read (Ralph A Bagnold’s Libyan Sands: Travel in a Dead World) while others worked on a craft project, making necklaces from the Cretaceous oyster shells on the ridge behind the station. Others played video games. Today was also Annalea’s birthday. We had pancakes and a party, and Yusuke made two videos for her with surprise comments from us. We had a great time, everybody dressed up (as far as we were able) and we decorated the station for the occasion. Slept very well last night. Woken up at four by the rat trap going off and rattling around. We had caught another pack rat, the fourth to date, whose presence was suspected but not observed. We took it on an EVA later in the day and released him near some sand dunes with lots of cover. Alex and I did the EVA: we went on one of the two-seat electric rovers, parking it at the base of North Ridge, a prominent hill north of the station. I’ve never been up this ridge before, and it was very steep. The views from the top were spectacular. Alex tested out a data management system attached to his suit. This has been an ongoing project for him on the expedition. The EVA provides a good opportunity to reflect on the respective roles of astronauts and robots. North Ridge is too steep and hazardous to be climbed by a robot vehicle such as those we currently use on Mars, although it was no more than a stiff scramble for us. Astronauts are able to access much more diverse and interesting sites than robotic systems, and do so much faster. The robotic vehicles are, however, great pathfinders and testbeds, and both astronauts and robotic systems are required to explore Mars. How many EVAs could we expect a Mars crew to do? I have estimated at least two a week for a six-person crew. We have averaged about four or five a week, but ours are typically short, only two to four hours. We have been working at roughly the same EVA tempo to what is predicted for an actual mission. This is our final day. It’s quite sad, leaving the station and saying goodbye to Anushree (who we were leaving at the town of Green River to catch the train), and to Shannon (who was staying behind to prepare for the next crew), but we were too busy to really experience the goodbyes. Before we knew it our cars were loaded and we had shoehorned ourselves into them. We are all much leaner after almost three months at the station, which may have helped us fit in. Then we were off, seeing familiar sights for the last time, as we drove out to the main road and then to Denver. Eight hours driving and a blizzard later we were receiving a warm welcome in the home of the Mars Society president in Denver, along with all the comforts of civilisation. Returning to “Earth” (normal life, family and friends) is a strange experience. Odd things stand out among the impressions. Here is a selection. So many people! Fresh fruit, vegetables and meat. Real eggs. Fatty foods take a bit of getting used to – uncomfortably heavy on the stomach. I seem to be extra sensitive to unpleasant smells such as smoking. So much of everything! Food, power, water, internet, space and people. Everything is so wasteful of water, such as toilet flushes and high-pressure taps. Seeing animals again - especially cats. Greenery everywhere, and the smell of eucalyptus. Runny nose from pollen. Lingering sadness of goodbyes to the crew mates but satisfaction and fond memories after a successful mission. Looking forward to keeping in touch and the next phase of the program. 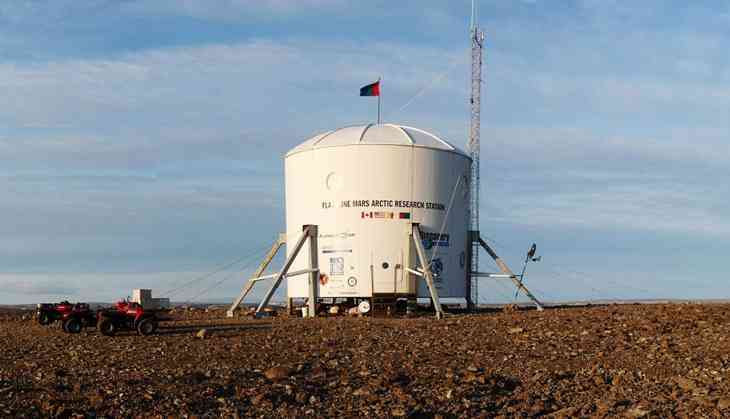 This will be two months at the Flashline Mars Arctic Research Station on Devon Island in the Canadian Arctic, and hopefully the topic of a later story in The Conversation. क्यों बोइंग को भारत में ज्यादा दिन तक जमीन पर रखना नहीं है आसान ?